Good language skills such as vocabulary, grammar, and storytelling are important for learning to read. Many children who start school without these skills may have problems later when learning to read. How can you help your preschooler prepare for reading success? Reading and talking with your child are activities you can do to help build early reading skills. Reading with your child has many benefits. It gives you a chance to reconnect after a busy day. Reading gives your child time to wind down and prepare for sleep. Reading stories can also help your child build skills that are important for reading and writing. Through reading to your child, he or she will learn new words, grammar, and storytelling skills. Reading and telling stories to your child models how to tell a story with a beginning, middle, and end using all the parts of a story: a cast of characters, setting, problem, and a solution. Conversation or talking also builds storytelling skills. Adults tell stories about the events of their day to each other. Similarly, when parents and children talk about their day, they are also exchanging stories. How was your day? Even older children have a hard time with this question. Instead of asking the question right away, model how you would answer by telling about your day first. Think of your day like a story with a cast of characters, the setting, the problems you encountered, and how you solved them. Talk about it in simple terms. Know your child’s classroom routines. Ask your child’s preschool teacher about what happened that day or keep the classroom calendar handy. You can use this information to help your child to talk about his or her day. First, Next, and Last. Use sequencing words such as first, then, next, last, before, and after when talking about your day to show the sequence in which things happened. Using sequencing words will help your child understand that order matters when talking about events. Choose books of high interest to your child. Ask your child’s teacher what the class is reading. Take a trip to the public library. Librarians have lots of information about preschool level books and new titles that you and your child might enjoy. Read it again and again. Children often ask for parents to read books over and over. Books that are very familiar can be “read” by children who are not readers and give them a chance to practice retelling stories. Make predictions. Before reading look at the book cover together. Ask your child what he/she thinks the book might be about before reading. As you are reading, ask the child to predict what might happen next. Build Vocabulary. 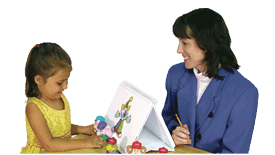 Substitute easier words your child knows for unfamiliar words he/she may hear in the story. For example, substitute do for achieve or noise for commotion. Who, What, Where, When? After reading, ask simple wh- questions. Who was in the story? What things happened? Where did they happen? When did they happen? Most preschoolers can answer basic questions. Give answers for questions they are unable to answer. Take Turns. Ask your child to retell the story to you. If your child needs support, leave out parts of sentences for your child to fill in. Have fun! Above all else, remember to keep it light and fun! Hugh W. Catts, Marc E. Fey, J. Bruce Tomblin, Xuyang Zhang; A Longitudinal Investigation of Reading Outcomes in Children With Language Impairments. J Speech Lang Hear Res 2002;45(6):1142-1157. doi: 10.1044/1092-4388(2002/093). Cherry-Cruz, T. (2001, December 26). Enhancing Literacy Through the Techniques of Storytelling. The ASHA Leader. Common Core State Standards Initiative (2010). Common Core State Standards for English Language Arts & Literacy in History/Social Studies, Science, and Technical Subjects: Appendix A. http://www.corestandards.org/assets/Appendix_A.pdf. Miller, L., Gillam, R., & Peña, E. (2001). Dynamic assessment and intervention: Improving children’s narrative abilities. Austin, TX: PRO-ED. Scarborough, H. S. (2001). Connecting early language and literacy to later reading (dis)abilities: Evidence, theory, and practice. In S.Neuman & D. Dickinson (Eds. ), Handbook for research in early literacy (pp. 97-110). New York: Guilford Press.